Potstickers. Quite possibly the best snack. Ever. In our house we've made them a meal, one giant bowl of chilli spiked, crisp bottomed deliciousness. I always make loads, planning to virtuously freeze half, ready to whip out at a later date, smug smile on my face. Never happens, we eat them all, every time. My son had a few friends over for his birthday last year, I made 120 as an entrée, they ate them all too. 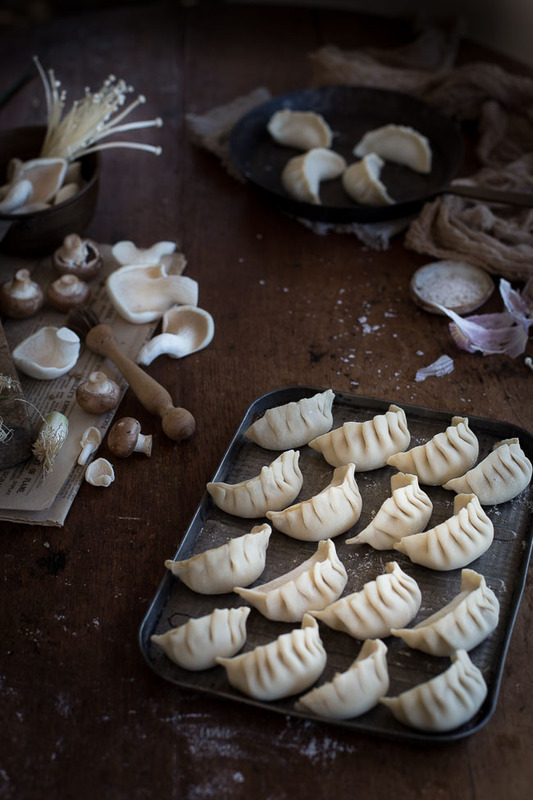 My love for home made dumplings was sparked last year, at a private dumpling workshop in a friend's gorgeous studio kitchen. 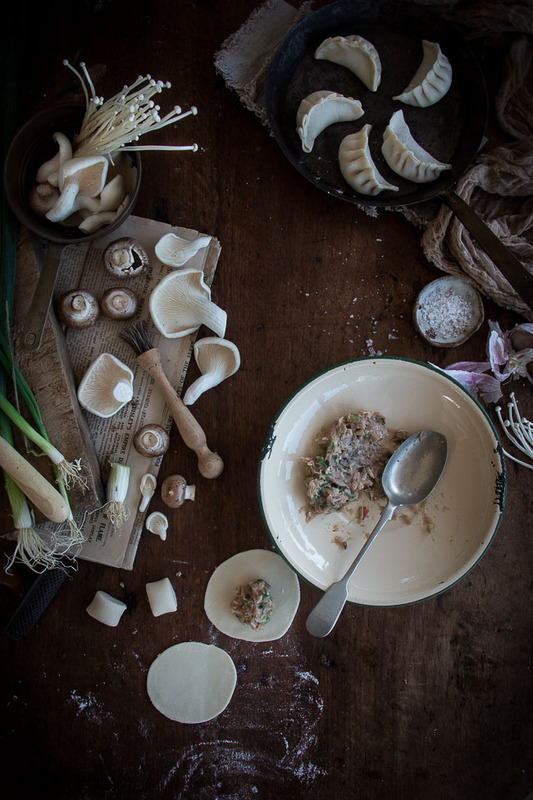 We had a riotous afternoon, the patient Vanessa sharing her dumpling knowhow. It's a lovely, in my case slow, process. The dough and filling are simple to make, rolling and shaping the dumplings, a little trickier. I've tried to explain the process below, it may be worth googling the technique, or attending one of Vanessa's workshops! This recipe makes 48, if it's your first time making them, or you're a bit slow like me, pop the first half in the fridge while you make the rest. If you do plan to freeze any, put the tray of dumplings, uncovered, in the freezer for 15 minutes then transfer them to a ziplock bag or freezer container, store them in the freezer for up to 3 months. 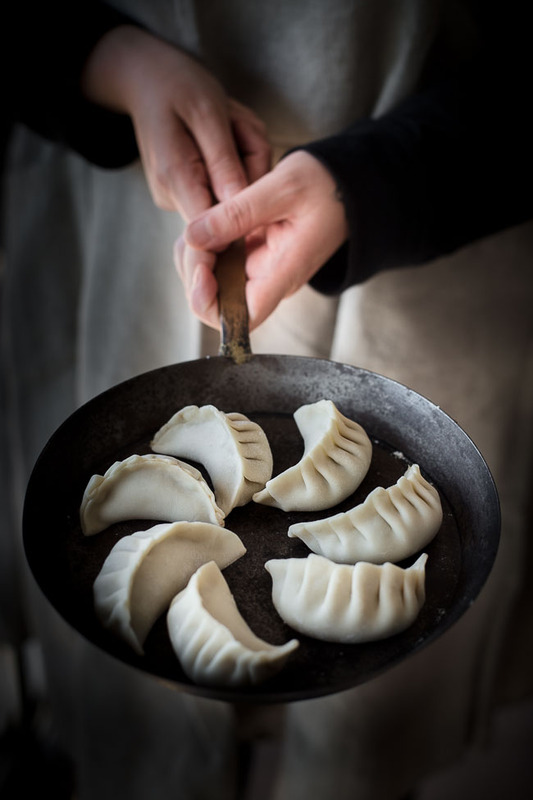 The dumplings can be cooked from frozen, just add a little extra water and steam them for 8 minutes not 4. You will need a non stick pan with a tightly fitting lid, I use a large 34cm pan to cook mine, the pan in the images is just for presentation, it looks so pretty! • place a heaped teaspoon of filling in the centre of the dumpling wrapper, fold in half so the edges meet in a semi circle, pinch together at the corner to seal, then form little pleats in one edge of the dumpling, squeeze the pleat against the other edge to seal; continue until you reach the other side, make sure the pleats are sealed and there are no gaps, place the dumpling on the baking sheet, gently flattening the bottom, cover with a damp cloth, and repeat with the remaining wrappers. 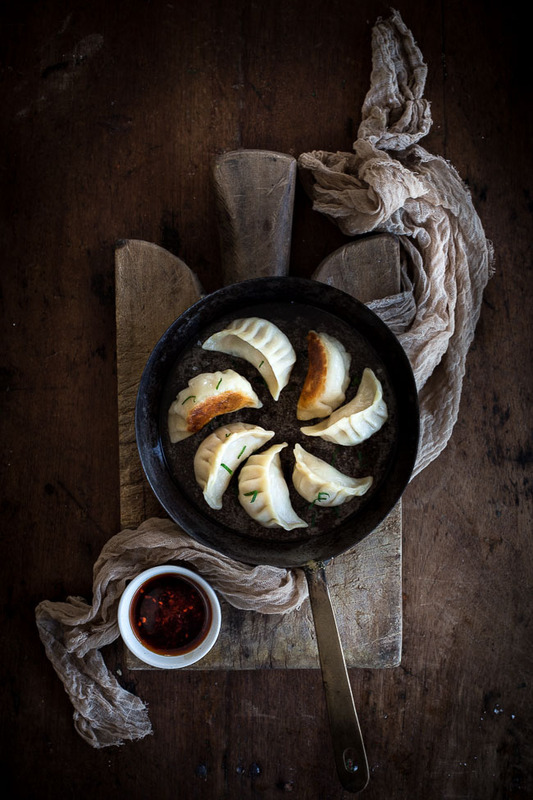 • heat a tablespoon of oil in a non stick pan, quickly fill with dumplings, flat side down (my large pan will fit 24 dumplings in 2 concentric circles) fry for 2-3 mins until golden, add 1/3 cup cold water, immediately clamp on the lid, leave to steam for 3-4 mins, remove the lid, allow the water to evaporate completely then let the dumplings fry again for a minute or so, serve immediately, sprinkled with ground szechuan pepper and a generous bowl of dipping sauce! • combine well, share between dipping bowls; recipe can be doubled/tripled and so on for sauce lovers!